I took February off from vocal coaching in order to listen to music, watch movies, read books, and be generally lazy. It has not, in large part, turned out that way. I mean, I've been lazy certainly, but not the gigantic swathes of time spent listening to songs or writing stories or napping that I'd envisioned and maybe even longed for. Then I got my hair cut. While this was one more thing to do it also counts as a perfect rest-month activity because Tonya is fun and her shop is calm and soothing and we have a lovely time hanging out. Today was, of course, no exception. Pretty early on she mentioned in passing that she's brainstorming ways to expand her clientele. I listed a few spectacularly average ideas before I took my usual turn into the realm of social media. We spent the rest of my hair cut and a nice chunk of time afterward talking about how Twitter works and why I think it's a powerful and even malleable tool for small businesses. In the course of my monologue, which wasn't anything resembling linear, I explained, to someone already suspicious of social media's usefulness, that every time I get my hair cut I take pictures of it and put it on the internet. The point I was working toward was that if she had a Twitter handle I'd include that when I posted the pics and would thereby boost her signal and name recognition and whatnot. I hope that's what she heard because I can easily understand how it just came across as weird. I'll own my weird, though. 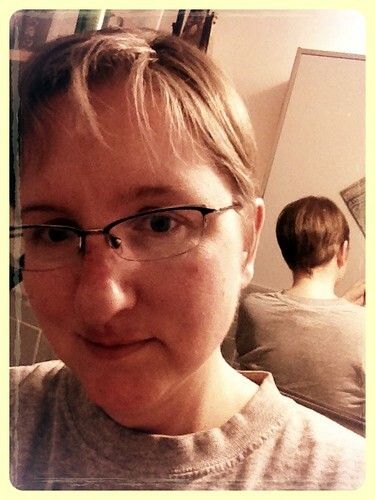 So here's a slightly arty photo of my new haircut*, both front and back in the same shot. I'm going to tweet it out soon. I hope Tonya sees it. *That's not a recreational Hitler mustache, I'm still healing from the topical chemo thing, it's peeling and red but doesn't hurt anymore and usually doesn't even itch so it's an improvement. I like the cut! I love a sleek, geometric, short cut like that. I have asked my stylist to go back to short, too, because I am damned tired of blow drying. cute hair! and i've actually heard of her establishment...wacky.